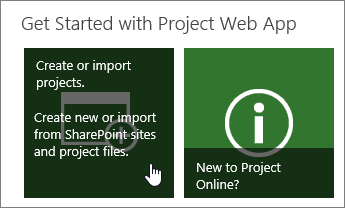 The easiest way to create a new project in Project Web App is to click Create or import projects, under Get Started with Project Web App on the main Project Web App home page. Next, choose which type of project you want to create. Enterprise projects offer sophisticated scheduling, including enterprise resource management and timesheets. If you choose to create an enterprise project, you will add tasks and assign them to people in Project Web App. SharePoint tasks lists are created as a project site with a tasks list. Tasks can be assigned to people and added to a timeline for a quick look at the overall plan. As you build your tasks list on the project site, those tasks will be viewable from the Project Center in Project Web App. 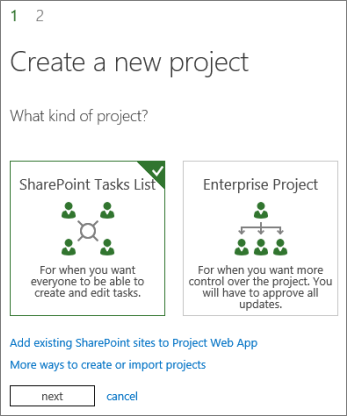 When you create a SharePoint Tasks List project in Project Web App, it starts as a task list on a project site. You can add tasks to your project, add those tasks to the timeline, or add files to the document library on the project site. 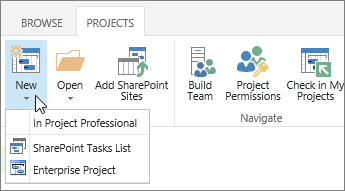 You can also add a task list from a SharePoint site into your Project Center, which lets you see workloads for everyone across SharePoint and Project Web App. Another option is to create a new project using Project Professional. In the Project Center, choose Projects > New. When you create a project this way, it is saved to Project Web App as an enterprise project. You can also create a project from scratch in Project Professional, and then save and publish it to Project Web App when you're ready.